Here's another view of the same shop window, from Google Streetview, September 2018. Nigels, if I'd known you were holidaying in Aber, I'd have invited you round!!! Should of had it running around a loop! 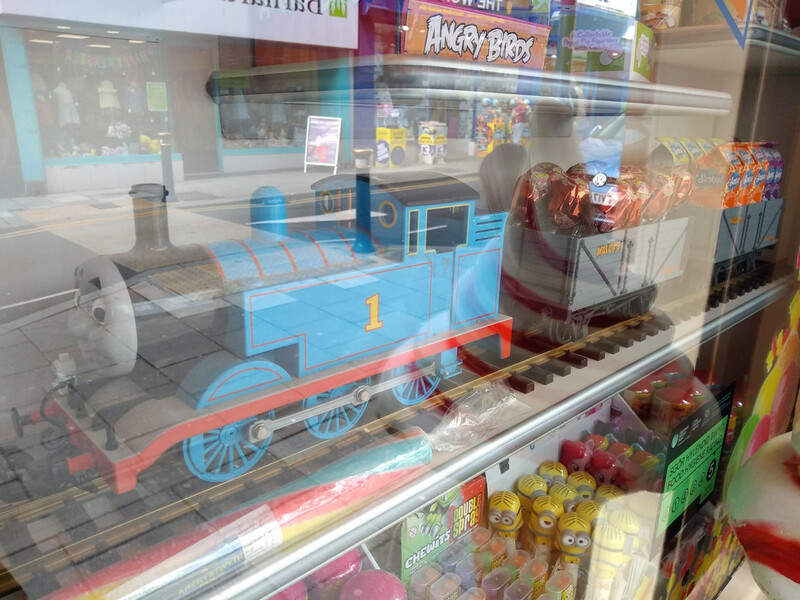 After all, what is widely credited as one of the first electric trains was built to be a store window display! Warning...Contact Sugar Buzz upon crossing the threshold. I never knew there was a G scale Thomas series. I’ve managed to get photos of some of the studio models, which are roughly 1/32 scale and surprisingly large. I can’t imagine how big G scale would be! The G Scale Thomas models are made by Bachmann and are 1:22.5 scale. The trucks are each around 12 inches long. There was also a tiny range of G scale Thomas models made by Lionel, but they didn't look much like they did in the show, but they still have charm in their own way. Model trains or TOMY? I don't know, I just don't know. I went back to the sweet shop today and ventured in. 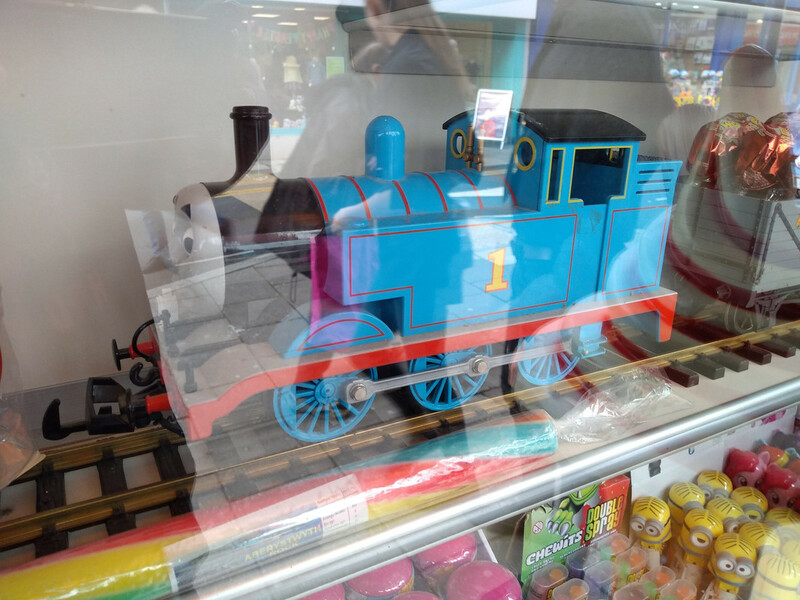 As well as the Thomas I the windows they had another Thomas with coaches running round a track. In addition there was also a James on another track and a percy on the shelf, neither running. Apparently James is not such a reliable runner so he has the nickname BR (British Rail), so he was static at the moment. Wow, that is quite the Candy Shop and very inviting to the Youngsters....and the youngster in us. Do they have like uniquely made candies or homemade or is it all manufactured treats? I think the Mom and Pop Sweet Shops have pretty much disappeared here in the States...at least in my area they have. Sure, there are still Bakery's making bread, donuts and cakes but not much in the way of candy. They stock a massive range, some UK, some USA possibly other countries too as well as a selection of hand made stuff. Great store.